Product prices and availability are accurate as of 2019-04-16 12:11:26 EDT and are subject to change. Any price and availability information displayed on http://www.amazon.com/ at the time of purchase will apply to the purchase of this product. THIS PRODUCT IS FOR SALE TO CURRENT COLLEGE STUDENTS AND TEACHERS ONLY. Both Windows and Mac versions included. 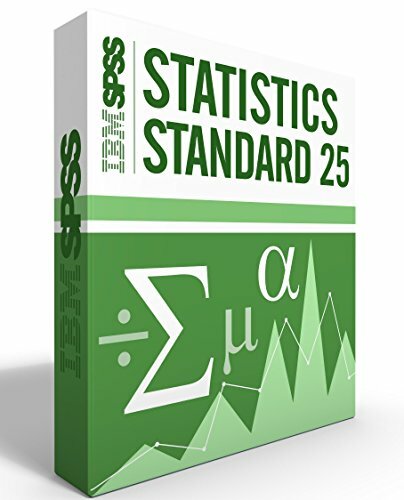 Includes two add-ons in addition to the full version of SPSS Base: Advanced Statistics and Regression. Includes these statistical tests: Crosstabulations - Counts, percentages, residuals, marginals, tests of independence, test of linear association, measure of linear association, and much more. Frequencies - Counts, percentages, valid and cumulative percentages; central tendency, dispersion, distribution and percentile values. Descriptives - Central tendency, dispersion, distribution and Z scores. Descriptive ratio statistics - Coefficient of dispersion, coefficient of variation, price-related differential and average absolute deviance. Compare means - Choose whether to use harmonic or geometric means and much more. ANOVA and ANCOVA - Conduct contrast, range and post hoc tests. Correlation - Test for bivariate or partial correlation, or for distances indicating similarity or dissimilarity between measures. Nonparametric tests - Chi-square, Binomial, Runs, one-sample, two independent samples, k-independent samples, two related samples, k-related samples. Explore - Confidence intervals for means; M-estimators; identification of outliers; plotting of findings. K-means Cluster Analysis - Used to identify relatively homogeneous groups of cases based on selected characteristics. Hierarchical Cluster Analysis - Used to identify relatively homogeneous groups of cases. TwoStep Cluster Analysis - Group observations into clusters based on nearness criterion, with either categorical or continuous level data. Discriminant - Offers a choice of variable selection methods. Linear Regression - Choose from six methods. Nearest Neighbor analysis - Use for prediction (with a specified outcome) or for classification (with no outcome specified).